Many visitors may be wondering why there are so many sea jellies floating in Boston Harbor right now. You can see them from the Boston Harbor Islands, during a New England Aquarium Whale Watch, even floating right next to the Aquarium! Check out this quick video taken next to the Simons IMAX Theatre, you can see all the moon jellies dotting the water. Well, this kind of thing happens every year. Some jellies can thrive in warmer waters. 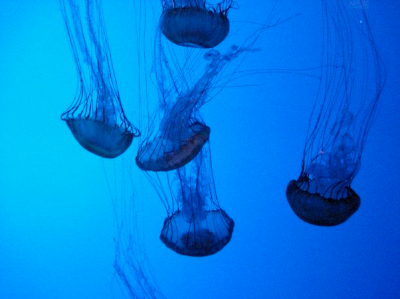 Incoming tides and currents will also corral jellies into harbors and marinas during the summer. At other times they hang out in deeper water, where you won't see them because of the water clarity. On the second level of the Aquarium, you can learn all about these brainless, graceful blobs, and why they are some of the best survivors in the world. As this Smithsonian Magazine article explains, they are uniquely suited to cope with some of the threats facing our oceans - like global climate change. Come by the Aquarium to see these unique sea creatures in action!